Seema smiled to herself. This was one of the most amusing parts of her one hour train commute to office. She loved eavesdropping on the heart-to-heart these two little 8-9 year olds had every day on their way to school. Today was their first day at school in the fourth grade after a long summer vacation. As Seema looked at the girl sulking over her eyeglasses, her heart went out to the little one. She was also a little taken aback at how peer pressure could affect such small girls. That the girl had gone around for at least two years with a blurry vision just so that she would fit in! Visual Acuity is often tested using a chart called Snellen’s. This chart is read by standing at a distance of 20 feet. The sharpness of your vision is represented as a fraction: the first part of the fraction is the distance at which you are standing. The second number is the maximum legible viewing distance. For eg if at 20 feet, you can read the letters on the row marked as 40, your visual acuity is 20/40 or better. As defined by the National Program of Control of Blindness in India, visual acuity in the better eye less than 20/200 is considered as blindness and less than 20/60 is considered as low vision. In the study which was published in the Indian Journal of ophthalmology, May - June 2012, school children whose vision improved with correction of refractive errors during the testing, were prescribed glasses. They were encouraged to buy the glasses using their own family resources. These kids were followed up 8-9 months later. Of the 120 students who had impaired vision, 72 had not undergone refraction at all citing parental refusal, unwillingness and other reasons. 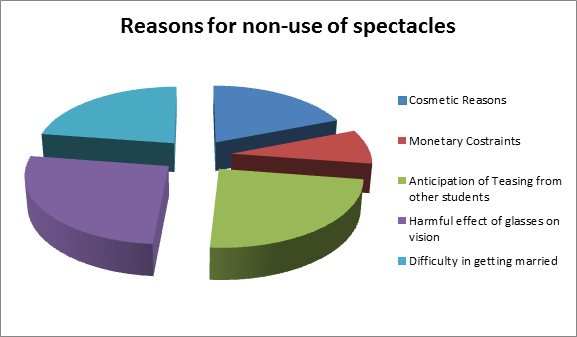 Only 10 students were found to be using their spectacles regularly for daily chores and studies! The most common reason cited by girls was difficulty in getting married (no boy cited this). Sounds familiar to the old adage ‘Boys never make passes at lasses who wear glasses’! The most common reason amongst boys was anticipation of teasing. A study conducted by Advanced Eye Hospital and Institute in Navi Mumbai, on 3,581 schoolchildren also highlighted how 64% of the children surveyed had poor vision but did not wear spectacles regularly as they were not persuaded enough at home or their need for eyeglasses was overlooked by their parents. If your kid or a kid you know has been advised glasses, the following tips might help these kids deal with it:• Your kid could tell his / her friends firmly that they hurt others’ feelings when they tease. • Or they could just ignore. People tend to stop teasing when they realize that you are not getting teased! • Make your child aware of the consequences of not wearing spectacles. • Show your kid pictures of movie stars and television personalities who wear glasses. Wearing glasses can be cool! • Talk to the teacher. You can request the teacher to let your child sit ahead in class or use a different colored chalk. Keeping the teacher in the know also prevents your child from taking off their glasses during school hours. • Teach your kid that there are a lot of people who are different from others in many ways and that they should be accepted as they are. • You could tell them about a 2008 study published in ‘Ophthalmic and Physiological Optics’ which studied children’s attitudes about kids in eyeglasses. The study found that children thought that kids who wear eyeglasses looked smarter and appeared to be more honest than others. • Allow your child to look through a variety of frames and have him or her pick out 3 favorites. If cost is a factor, reserve the right to have the final choice out of these 3. Help your child understand that confidence is the most beautiful thing that they can wear! Department of Pediatric Ophthalmology at Advanced Eye Hospital and Institute (AEHI) in Navi Mumbai has a huge focus on preventive eye health and eye care for children. Child eye specialists, eye doctor and optometrists spend time in community outreach programs and do eye checkups at schools and institutes to diagnose eye problems in children early.